Several motor vehicles were caught by an icy flood in the Kennebec River on Jan. 13 in downtown Hallowell when an ice jam formed downstream, causing water to overflow its banks. Officials are concerned that if the ice jam gives way, another one could form downstream, causing flooding in Gardiner, where water likely would back up into parking lots at Hannaford and other low-lying places along the river. Sean Goodwin, deputy emergency management director for Kennebec County, said local communities have asked the Coast Guard to help break up the frozen section of river between Richmond and Gardiner. The Coast Guard has been handling ice jams elsewhere in the Northeast, he said, but may be able to send a vessel up the river to break ice on Wednesday. Al Nelson, Gardiner’s fire chief, said Thursday the city is keeping an eye out for that possibility. If the ice jam in Farmingdale “decides to let go and move down, we’ve obviously got a problem,” he said. The lack of an active flood warning on Friday doesn’t mean the danger has passed, Hawley said. Around midnight on Jan. 13, after forecasters and emergency management officials had warned the public that impending heavy rain was expected to cause flooding, low-lying areas in Augusta and Hallowell quickly became submerged when ice dammed up the river between Farmingdale on the west bank and Randolph on the other. 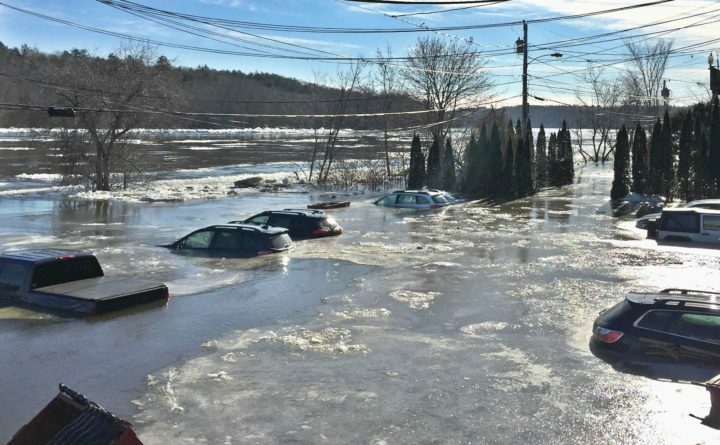 Icy waters enveloped two cars and and seeped into a couple of buildings on Front Street in Augusta, according to Sean Goodwin, deputy emergency management director for Kennebec County. In Hallowell, on another Front Street in that city, 17 vehicles were partially or fully submerged by the rising water. Ice jams in the river are not unusual in the winter, and when they do occur the river can overrun its banks with surprising speed, according to Goodwin. The severe cold spell that gripped Maine for roughly a week in late December and early this month has aggravated the flooding potential. The cold snap froze a lot of water, which has resulted in more ice in the rivers, including the solid sheet of ice that covers the Kennebec from one bank to the other just downstream of the blockage in Farmingdale.